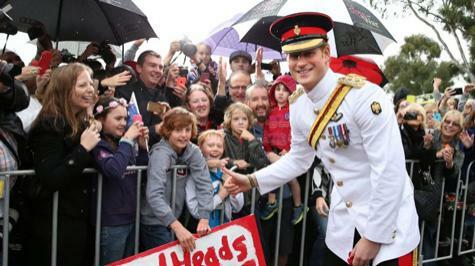 Prince Harry proved he's a winner when he mingled with the crowd at the Australian War Memorial in Canberra on Monday. The British Royal Family continues its recent charm offensive in Australia with the arrival of HRH Prince Harry just 19 days before we celebrate the 100th anniversary of the Gallipoli campaign of World War I. Prince Harry delighted the 1,500-strong crowd who awaited his arrival in damp Canberra on Monday when he joined 12-year-old carrot-topped Ethan Toscan who held aloft a placard saying ‘Redheads Rule!’. Ethan told reporters that Prince Harry agreed, saying being a redhead was the best thing you could be. The popular prince spent around 15 minutes in a meet and greet with the crowd of well-wishes - not to mention a few princess wannabes - having selfies taken and working the adoring crowd effortlessly in the rain. In formal white military uniform, ‘Captain Wales’ as he is known in the British Army, joined the Chief of Defence Force, Air Chief Marshall Mark Binskin, and the Governor-General, Sir Peter Cosgrove, to lay a wreath at the Tom of the Unknown Solider before touring the Afghanistan and World War I galleries at the Australian War Memorial. And in case Air Chief Marshall Binskin and the G-G didn't quite realise how well connected their young guest is, Prince Harry handed them a personal letter of thanks from his grandmother the Queen. Prince Harry is in Australia for a month-long tour of duty with the Australian Army, with a few days out to join his father in Gallipoli for the Centenary Commemoration on April 25. While in Australia, Prince Harry will work with Australian Army units in Sydney, Perth and Darwin with a focus on the work of special forces such as the SAS.